Question 1 In situations with high risks, credit might create further problems for the borrower. Explain. Answer 1 At times repayment of the loan becomes difficult and credit instead of improving the earnings, pushes the borrower into a situation from which recovery is very difficult and painful. This situation is called debt-trap. Then the borrower is forced to give up his collateral or asset used as the guarantee to the lender. Question 2 How does money solve the problem of double coincidence of wants? Explain with an example of your own. Answer 2 In a barter system, commodities are exchanged with commodities without the use of money. But in this type of exchange, both parties have to agree to sell and buy each other’s commodities. This is called double coincidence of wants. Money solves the problem of double coincidence of wants by acting as a medium of exchange. The transactions are made in money because a person holding money can easily exchange it for any commodity or service that he or she wants. For example, suppose an ice-cream vendor wants a bicycle but the bicycle manufacturer wants clothes, and not ice-creams. In such a situation the vendor can use money to obtain a bicycle. In the same way, the bicycle manufacturer too will use money to buy clothes. Question 3. How do banks mediate between those who have surplus money and those who need money? Answer 3 Banks keep only a small proportion of their deposits as cash with themselves, as a provision to pay the depositors who might come to withdraw from the bank on any given day. They use their major portion of the deposits to extend loans. mediate between those people who have surplus funds (depositors) and those who are in need of those funds (the borrowers). They charge higher rate of interest on the loans than what they offer on deposits. The difference between what is charged from borrowers and what is paid to depositors is their main source of income. Question 4. Look at a 10 rupee note. What is written on top? Can you explain this statement? Answer 4. A ten rupee note has “Reserve Bank of India” written on the top, followed by a statement “Guaranteed by the Central Government”. It is a promissory note and can only be issued by the Reserve Bank of India which supervises all money-related functions in the formal sector in India. The statement on the ten rupee note relates to this idea that the RBI is the central organ in the working of money-related activities. Question 5 Why do we need to expand formal sources of credit in India? Answer 5 Compared to the formal lenders most of the informal lenders charge a much higher interest on loans. It means that the cost to the borrower of the informal loans is much higher. Higher cost of borrowing means a larger part of earning of the borrowers is used to repay the loan and they have less income left for themselves. The high rate of interest of borrowing can mean that the amount to be repaid is greater than the income of the borrower and this could lead to increasing debt and debt-trap. People who might wish to start an enterprise by borrowing may not do so because of the high cost of borrowing. For these reasons banks and cooperatives need to lend more. This would lead to higher incomes and many people could then borrow cheaply for a variety of needs. They could grow crops, do business, set up small-scale industries etc. They could set up new industries or trade in goods. Cheap and affordable credit is important for the country’s development. Hence, it is necessary to expand formal sources of credit in our country. Question 6. What is the basic idea behind the SHGs for the poor? Explain in your own words. Answer 6 Self-Help Groups (SHGs) consist of certain members who pool their savings and constitute a fund which is further used in making finance and advances to other members. The SHGs help borrowers overcome the problem of lack of collateral. They can get timely loans at a reasonable interest rate. They help women to become self-reliant. Question 7. What are the reasons why the banks might not be willing to lend to certain borrowers? 1. Some persons are not able to produce certificate of their earning. 2. There are some people who have a history of non repayment of loans. 3. There are other people who are not able to produce documents of their employment. 4. Some persons have nothing to give to bank as collateral. 5. There are a few others who fail to produce two persons who can stand as surety in case he is unable to repay the loan. Question 8. In what ways does the Reserve Bank of India supervise the functioning of banks? Why is this necessary? Answer 8 The Reserve Bank of India supervises the functioning of formal sources of loans. The RBI monitors the banks in actually maintaining cash balance. Similarly, the RBI sees that the banks give loans not just to profit making businesses and traders but also to small cultivators, small-scale industries, to small borrowers, etc. Periodically banks have to submit information to the RBI on how much they are lending, to whom, at what interest rate, etc. Question 9. Analyse the role of credit for development. Answer 9 . Credit refers to an agreement in which lender supplies the borrowers with money, goods and services in return for the promise of future payments. Whether credit will be useful or not, depends upon the risks in the situation and on whether there is some support in case of loss. When a borrower takes a loan from the bank for increasing the production of goods and he/she is able to increase it and pay the loan back to the bank within the given time limit, then credit has played a positive role in making him/her wealthy. Question 10. Manav needs a loan to set up a small business. On what basis will Manav decide whether to borrow from the bank or the moneylender? Discuss. 1. Firstly, he must have a collateral or asset which can guarantee his loan. If he lacks such an asset, he cannot get a loan from the bank. In this scenario, he will have to go to a moneylender, even though the latter charges a higher interest rate. 2. Secondly, if Manav is not aware of the banes of borrowing from the informal sector, he might not even consider taking a bank loan. 3. Thirdly, if there are no banks in or near his area of residence or work place, then he will borrow from a moneylender. Question 11. In India, about 80 per cent of farmers are small farmers, who need credit for cultivation. Answer 11 (a) Banks might be unwilling to lend to small farmers because small farmers usually lack proper documents and collateral or asset. (b) The other sources from which the small farmers can borrow are moneylenders, relatives or friends, selfhelp groups and cooperative banks. (d) Self-help groups and cooperative banks do not require collateral as a guarantee; hence, they can provide cheap credit to the small farmers. (i) Majority of the credit needs of the ……… households are met from informal sources. (ii) ……… costs of borrowing increase the debt-burden. (iii) ……… issues currency notes on behalf of the Central Government. (iv) Banks charge a higher interest rate on loans than what they offer on ………. (v) ……… is an asset that the borrower owns and uses as a guarantee until the loan is repaid to the lender. Question 13. Choose the most appropriate answer. Question 1. The following table shows people in a variety of occupations in urban areas. 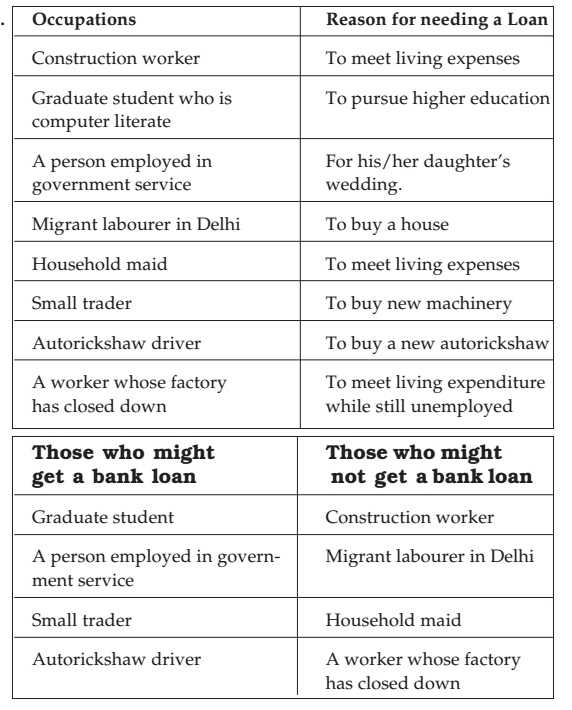 What are the purposes for which the following people might need loans? Fill in the column. The criterion I have used for the aforementioned classification is firstly, whether the borrower has the potential to repay the loan or not. Those with job security will certainly get a loan from a bank because they have the capability to give repayment instalments. The second basis of classification is whether the borrower has a collateral or not, on which to guarantee his/her loan. These two are the basic prerequisites for getting a loan from a bank.